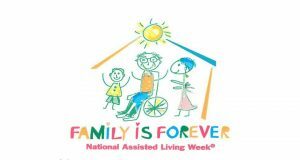 YOU are cordially invited to celebrate National Assisted Living Week with the staff and residents of the Blue Valley Lutheran Homes Courtyard Terrace! “Family is Forever” Everyone is welcome. The schedule of events is below. 2:00 p.m. – Special Bingo! 2:00 p.m. – Game Day! 4:00 p.m. – Toasts and Treats! 11:00 a.m. – Nebraska vs. Northern Illinois Football Game!